Share the post "Gloriosa Superba Or Flame Lily Growing Tips & Facts"
Gloriosa superba or a Flame lily is a beautiful, exotic-looking, easy to grow plant, which is widely cultivated as an ornamental for its stunning flowers. 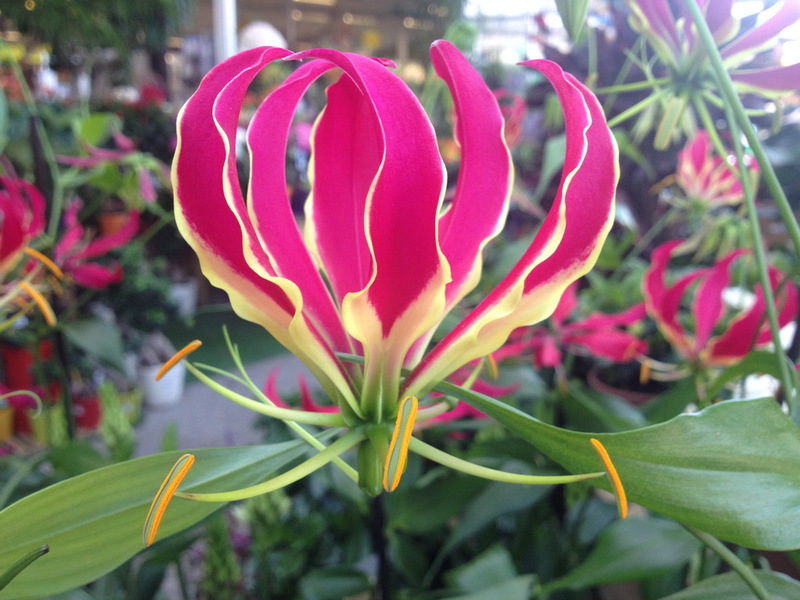 Gloriosa lily will add unique interest to your garden or indoor setting. The name Gloriosa means ‘full of glory’ and the specific epithet superba means ‘superb’, alluding to the striking red and yellow flowers. Flame lily vines are an excellent choice for growing in containers (both indoors as houseplants and outdoors) or for weaving through an open fence. Gloriosa lily plants make lovely fresh-cut flower arrangements as well. If you cut the flowers just before the petals bend back, they will last up to eight days in an arrangement. The showy flower has six tepals each. The margins may be quite wavy. The six stamens also are long, up to 4 centimeters, and each bears a large anther at the tip that drops large amounts of yellow pollen. The fruit is a large (up to 6 cm long), oblong capsule. Gloriosa lily is native to much of Africa and Asia, but it is known worldwide as an ornamental plant, a medicine, a poison, and a noxious weed. It grows in many types of habitat, including tropical jungles, forests, thickets, woodlands, grasslands, and sand dunes. Flame lily is in decline in some areas of India, Sri Lanka, Bangladesh and southern Africa, due to over-collection of the seeds and tubers. Although commercially cultivated in southern India, it is estimated that pharmacies and drug manufacturers in India fulfil up to 75% of their raw material demand from wild populations. Flame lily is the national flower of Zimbabwe (where it is protected from illegal harvesting under the Parks and Wildlife Act). It is also the state flower of Tamil Nadu. Cultivars: ‘Lutea’ has all-yellow tepals. ‘Citrina’ is yellow with red markings. ‘Nana’ is a dwarf. Plant type: Tropicals. Tender Perennials. Vines. Climbers. Hardiness: USDA Zone 8 – 11 (plants can be overwintered successfully in zone 9 with winter mulch. In cooler areas, Climbing lilies can be grown successfully during the summer and lifted and stored for the winter). Soil: Well-drained. Alkaline. Sandy-loam soil. It can grow in nutrient-poor soils. Time to plant: spring after the soil has warmed. To extend the blooming period of gloriosas, start the tubers inside in late winter and then transplant them to the garden in spring. Propagation: by seed; by dividing rhizomes, tubers, corms or bulbs (including offsets). Plant approximately 2 inches deep. The tubers should be set horizontally in the holes. This plant is slow to propagate; each split tuber produces only one extra plant in a year’s time. The new plants will form tubers in their third season. Medicinal Uses: Flame lily has a wide variety of uses, especially within traditional medicine as practised in tropical Africa and Asia (including Ayurvedic medicine in India). It has been used in the treatment of gout, infertility, open wounds, snakebite, ulcers, arthritis, cholera, colic, kidney problems, typhus, itching, leprosy, bruises, sprains, hemorrhoids, cancer, impotence, nocturnal emission, smallpox, sexually transmitted diseases, and many types of internal parasites. It is an anthelmintic. It has been used as a laxative and an alexiteric. The sap is used to treat acne and head lice. In a pregnant woman, it may cause abortion. In parts of India, extracts of the rhizome are applied topically during childbirth to reduce labor pain. It is in great demand for medicinal use, so it is cultivated on farms in India, but most plant material sold into the pharmaceutical trade comes from wild populations. Other Uses: Arrow poison in Nigeria and snake repellent in India. Some cultures consider it to be magical. The flowers are part of religious rituals. The seeds and rhizomes are sold whole, as powder, or as oil extracts. Invasive: Can be. Flame Lily is listed as a weed in Australia and in some parts of the USA. Toxicity: Gloriousa Lily is poisonous, toxic enough to cause human and animal fatalities if ingested. Every part of the plant is poisonous, especially the tuberous rhizomes due to the presence of toxic alkaloids, including colchicine and gloriocine. Contact can result in skin irritation. It has been used to commit murder, to achieve suicide, and to kill animals. The plant can be dangerous for cats, dogs, horses, and livestock. • Use gardening gloves when working with the plant. • They die back to the ground in fall, but return in the spring. • After blooming, gradually stop watering the plants, then dig and store the tubers. They can be left in pots of dry soil until spring, when they should be replanted in fresh soil. In suitable climates, however, they can be left in the ground over winter if sheltered from cold, damp conditions. Do you grow Gloriosa Superba (Flame Lily) in your garden? What is your experience with this plant? Please share with other fellow gardeners in the comments below! 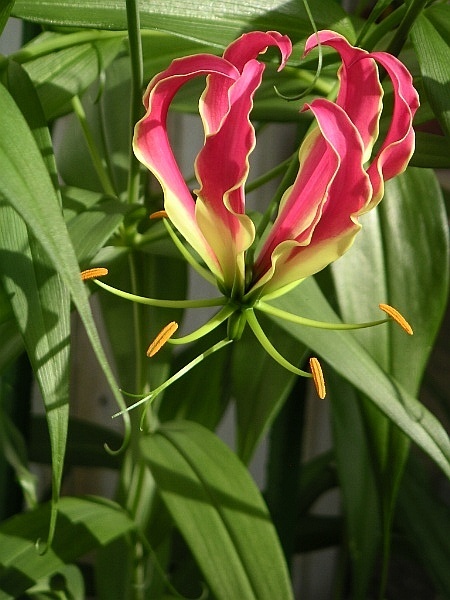 Do you sell Gloriosa Superba (Flame Lily) seeds or have plants for sale? You can place your advertisement here. Contact us now!